If you are searching for “power steering repair“, “suspension repair“, “steering and suspension repair shops” or “power steering repair shop near me” in Scottsdale, Bridwell Automotive Center can help! Give us a call today at (480) 948-4781, Get a quote using our contact form or stop by our power steering repair shop located at 7171 E Lincoln Dr. Scottsdale, Arizona 85253. If your wheel is getting harder to turn, your are hearing grinding noises when you turn or your vehicle is leaking clear fluid, you most likely have a power steering problem. 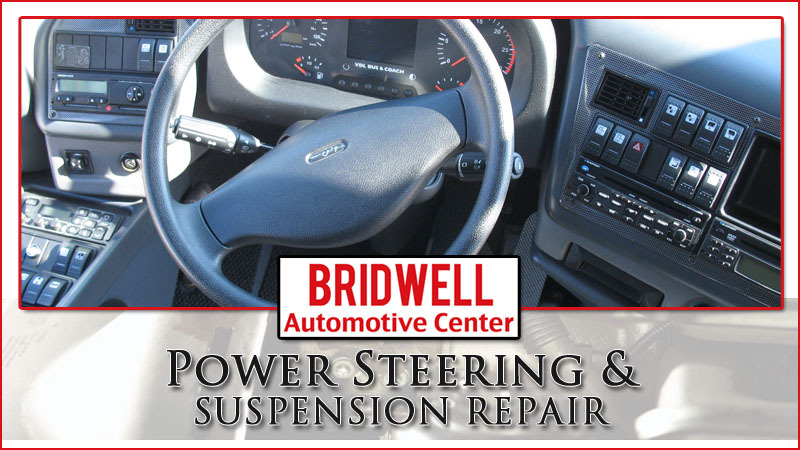 Bridwell Auto Center can repair or replace your power steering system depending on what is causing your issue. Watching for the following warning signs will help you spot problems with your power steering system. If you notice any of the following power steering problems, bring your vehicle into a repair shop immediately. Turning the wheel of the vehicle is difficult. Over time and miles driven, your power steering fluid can build up small amounts of wear products. These products are bits of metal, rubber and plastic from the inside of the power steering system and naturally wear. Although, as these particles move around the power steering fluid, they accelerate the wear component seals in the system. Since power steering systems do not have a filter, the only way to get rid of these particles is to remove the old power steering fluid out of the vehicle and replace it with new fluid. This removal and replacement of fluid is known as a flush. A honest mechanic will recommend power steering flushes at regular factory recommended intervals, or when your fluid has become black, brown or contaminated. However, if your vehicle sees a lot of wear and tear from towing or hauling, you might need to get your fluid replaced sooner than the regular intervals. Bridwell Automotive Center can diagnose your steering and suspension system to find out what the problem is and offer a repair solutions. We only have our ASE certified mechanics inspect your steering and suspension system to offer repair recommendations with cost estimates. Our automotive mechanics can diagnose your power steering or suspension issue and offer repair or replacement services to fix it for you. Our diagnostic process will also help identify any other issues that might be contributing to the signs you let us know about during the consultation. No matter what the problem is we will find it, offer affordable rates for repair, and get you back on the road quickly! Give us a call today at (480) 948-4781, Get a quote using our contact form or stop by our auto repair shop located at 7171 E Lincoln Dr. Scottsdale, Arizona 85253.